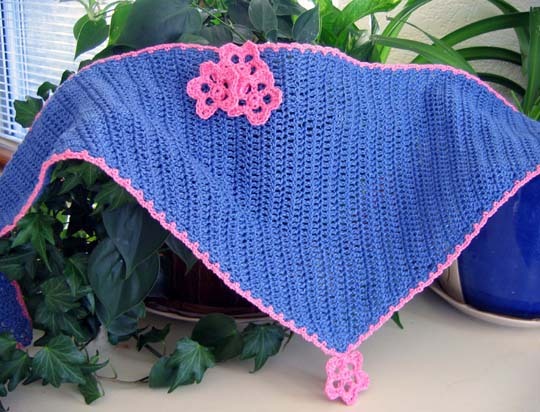 While focusing on creating new hat designs, I played with some kerchief ideas for spring and summer wear. 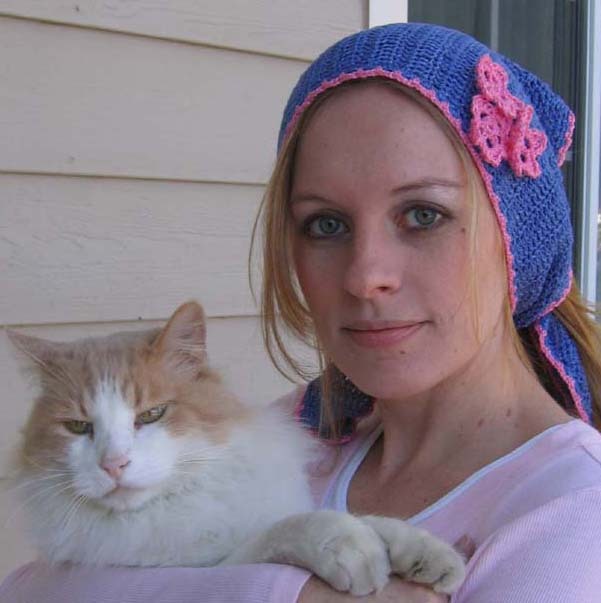 After a successful knit design was completed, I knew I had to do one for crocheters! One of my favorite techniques is working crochet from side to side so that even simple, basic stitches form different-looking vertical patterns. 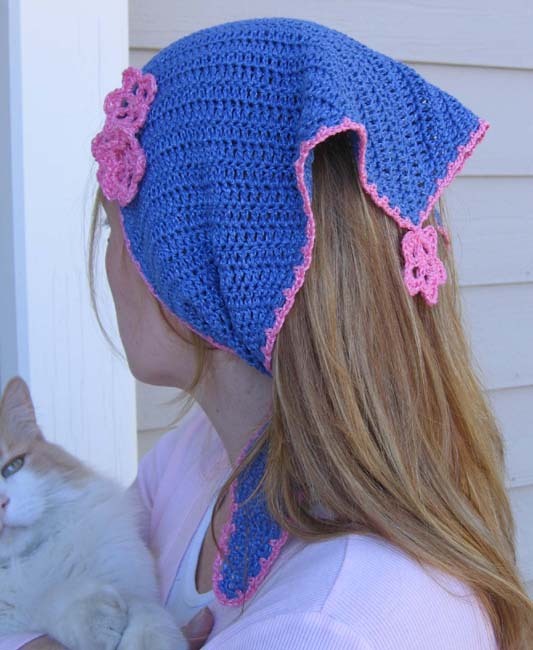 The softly draping Summer Blue Head Scarf is the result. Simple and fun-to-work, the scarf is trimmed with flower embellishments for a sweet peasant-style look. US E/4 (3.50 mm) or size needed to obtain gauge. Scarf is worked back and forth in rows from side point to side point. Triangle shaping is achieved by maintaining increases/decreases along one edge with other edge remaining even (straight). Place contrast thread marker along increase/decrease edge as a guide to keeping increases/decreases at same side throughout scarf. With MC, ch 4, work 2 dc in 4th ch from hk (3 dc). Mark as right side. Row 95 Ch 3, turn, dc2tog. Do not cut yarn, do not turn. Continuing with MC and with right side (front side) of piece facing, ch 1, then sc around entire piece with somewhat loose tension so that work lies flat, working 2 sc in end of ea row and 3 sc at ea point of triangle. Join with sl st and fasten off MC. Round 2 With right side (front side) of piece facing, attach CC at center back point on triangle, ch 1, sc in same sc, *ch 3, sk next sc, sc in next sc,* rep from * to * around entire scarf, join with sl st to beg sc. Fasten off and weave in ends. Round 3 *In next ch-5 lp work (sc, hdc, dc, ch 2, dc, hdc, sc),* rep from * to * around, join with sl st to beg sc. Cut yarn, leaving 12” tail for sewing and fasten off. Arrange 3 flowers and sew to front of scarf approximately 8 rows to left of center as shown. Attach 4th flower so it hangs from center back point. Finish off and weave in all ends.